The Colosseum was an arena where Roman gladiators fought – often to the death. Based in Rome, Italy, this building still stands, and is visited by millions of people every year. Call of the Colosseum from NextGen Gaming brings these gladiator battles to life. The famous ‘thumbs up / down’ from the Emperor used to mean life or death to a Gladiator. In this game, the meaning is less sinister. The Emperor will decide whether you get more free spins or not! Like many older NextGen Gaming pokies, the appeal here is with solid gaming – not multiple fancy bonus features. You’ll be pleased to hear that there are several ways to win big. Aside from the regular winning symbols, there are two special symbols in play. On the middle three reels, you will see the Emperor of Rome. This guy wears a red cape – and is a wild symbol. This symbol will often connect multiple wins – leading to the sharp drum sound that comes with them. It will not substitute for the shield scatters. Those shields reveal a gladiator when you get two or more of them on the reels. You will also get a scatter prize based on the total in view. This can be big – with 100x your triggering bet for five. Four will pay 20x that bet, with 5x for three and 2x for just two, anywhere in view. Best of all, three or more scattered shield symbols will trigger the free spins bonus game. 10 free spins start you off when you trigger this bonus – though these can be extended. Every time an Emperor wild appears, he will stick out his thumb. There is a pause (just long enough to get the anticipation levels rising) and a drum roll. He then either points the thumb up or down. If it goes upwards, you will zoom in on his ring. This shows a red gem, which will award you between 1 and 3 extra free spins. If you get more than one wild symbol they will work independently – it is possible to get all three adding spins at once. Any wins you get during this bonus game are doubled compared to the pay table – giving you an extra incentive to extend the bonus. There are no ‘filler symbols’ like playing cards for this NextGen pokie. The Roman-era symbols are led by a lady wearing a golden headband. This is worth 5,000 coins for five during the base game of this online pokie– or 10,000 during the free spins bonus. Next comes a fierce-looking tiger, with a chain around its neck. This is worth 2000 coins for the maximum five. The Colosseum and a helmet complete the highest paying symbols. Shields, coins, boots and a bunch of purple grapes are included in the line up of lower paying symbols. Wilds only appear on the middle three reels – and so can’t create wins of their own. You’ll spin over a regular 5-reel, 3 row grid. As a default, there are 25 win-lines – these are changeable this time. There is a big stone arch over the reels, supported by classic ribbed columns decked with vines. By contrast the reels are plain, with simple graphics for the symbols. There are some nice small touches. Instead of a fountain of gold coins for your wins, you’ll see red roses thrown into the air. Only the Emperor and Gladiator symbols have animations. The Gladiator appears suddenly from behind a shield – jabbing a sword at you. The emperor throws rose-petals. The best animation (and the best music) is saved for the bonus feature. You’ll see a lot of thumbs (both up and down) while you spin! 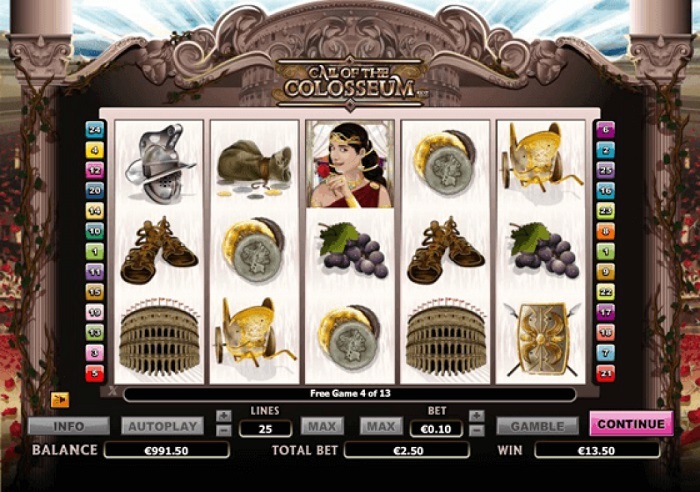 Will You Give the Call of the Colosseum Pokies a Thumbs Up? In many ways, this pokie plays to the strengths of NextGen Gaming. It is straightforward and enjoyable – without getting too complex. Big line hits are possible in the base game, especially when you get 2 or 3 of the wilds on the middle reels. In the free spins bonus your wins are doubled. If you are lucky enough to get the thumbs up from the Emperor, you could extend this bonus well beyond the initial 10 spins.